E.T. MacKenzie Co has finished clearing at the detention basin located at the corner of Richard and Hamilton Streets and is in the process of excavating and hauling earth material from the detention basin. Seeding and restoration of the basin will take place once the excavation is completed. Excavation and maintenance on the detention basin located behind Family Video is also slated to start in the upcoming week. Once the detention basin has been constructed, the mainline storm sewer pipe work will start along Richard Street. The contractor anticipates beginning installation of storm sewer by the end of this week as well. This work will require the contractor to close Richard Street to through traffic but access for local landowners will remain open at all times. Neighbors in the area should continue to expect to see large equipment moving in and out of the site along Richard, Dean, and Auburn Streets. Neighbors should also anticipate minor traffic delays while driving past the construction activity. As with all construction projects this timeframe is subject to weather and any other unforeseen delays. Moving ahead of the main construction activities, E.T. 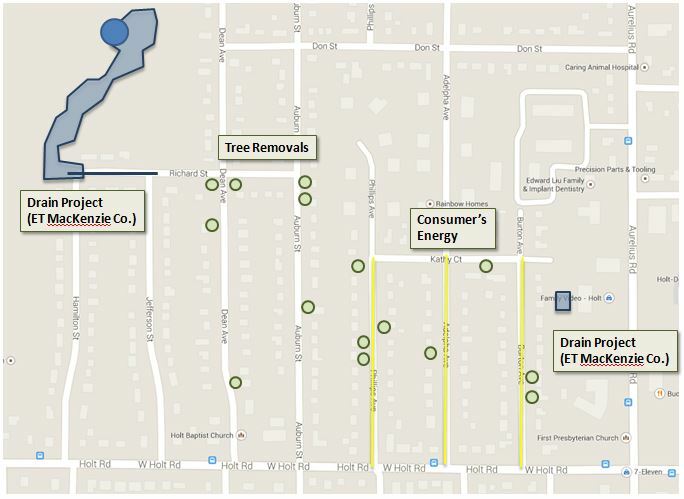 MacKenzie is working with a tree removal company to remove the trees necessary to perform the drain work. You may see these crews throughout the neighborhood working to stay ahead of the main construction activities. The Township’s work to replace two sanitary manholes located at the intersections of Richard and Jefferson and Richard and Dean has been completed.